A former regional daily sub-editor who launched a monthly newspaper before selling it on to new owners has quit to help launch another new title. Pete Spence has begun work as editor of the Bridlington Echo after leaving the Scarborough Review, which he founded in 2013. The former Scarborough News sub-editor sold the free Review to York-based Your Local Link Media in November 2014, but retained its editorship until last week. He will now head up a team of six design and sales staff at the Echo, which will hit the streets for the first time next month. The new paper is being launched by print distribution company the BKR Group who approached Pete to become its editor. The free 32-page tabloid will begin life as a monthly publication with a print run of 10,000 covering Bridlington, Filey and Hunmanby. As was the case at the Review, Pete will be up against his former employer Johnston Press. While the Review was a direct competitor to his old paper the News, the Echo will compete with another JP paid-for weekly in the form of the Bridlington Free Press. Said Pete: “Based on the model of the Scarborough Review we know that free hyper-local newspaper publications can work very well. Chris Barker, managing director of the BKR Group, added: “The local community has wanted a paper like this for a long time. This is an obvious choice to offer a printed newspaper product alongside the other forms of online and direct marketing we already offer. Good lad. Here’s to success against Johnston Press. Is this really a “news” paper though? It looks to me like an advertising vehicle–nothing wrong with that–but to call it a “news” paper….hmm! Well good luck with this – but two things spring to mind. First, trying to do ‘news, when it’s a monthly is very hard because any interesting news quickly becomes old news which means stories are limited to those less dynamic ones that people already know about. Also that front page is a shocker. Who would want to pick up that? It has a gloomy image with no human interest whatsoever. 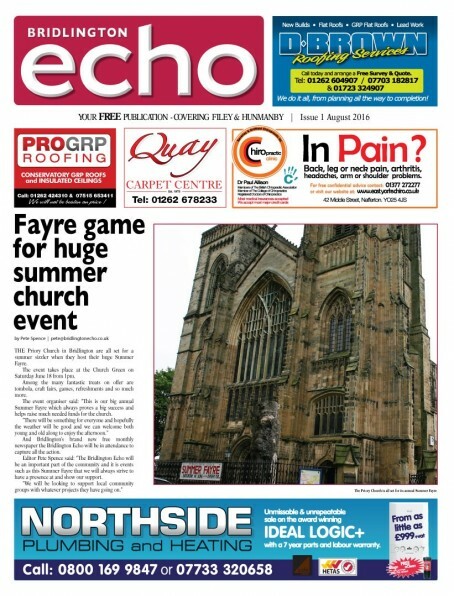 – and as a front page lead a summer fayre is hardly going to set pulses racing with anticipation. I have never been to Bridlington but surely there is more to it than that? Interesting to note that the paper was not that much of a success given the statement it put out after Mr Spence left. “Save” is the key word in this post, it suggests that without an actual publisher stepping in the business was going under. As some of you may already know, our Editor, Peter Spence is moving onto pastures new. We would like to say a huge thank you to Pete for all of his hard work. The newspaper wouldn’t exist if he hadn’t taken the risk to launch against an established newspaper group. He had the foresight to seek help when the project escalated beyond a one man band. As a family run business we promise to keep the very same local values, with all of the great local interest stories that Scarborough Review is known for, just as it has been for the last two years since we stepped in to save this great local paper. Good luck to Pete in whatever venture he chooses next and thank you for your continued support! Desker you make some interesting points, and it s something that all new ventures need to consider. There’s simply no point setting up a new hyper local paper if all you are going to do is offer the same bland content that resulted in the failure of hundreds of local paid fors and frees. Sure you can Hoover up a some local advertising but if the local businesses find it boring and their customers don’t read it than pretty soon it is a dead duck – that happened to a rival paper to mine some years ago. Simply chanting the mantra “hyper local” means nothing if allyou are offering is the usual round of tedious press releases about “the world’s largest coffee morning”. A monthly could work – although it is not easy – if you are prepared to put in the effort and publish well written, intelligent analysis of the big local stories, thought-provoking features and interesting interviews. PERCY: I was in Scarborough a year ago and picked up a copy of both the review (it’s free in most supermarkets) and the Scarborough News (which, shockingly, was actually a decent JP paper). need better front pages than this one! Dull, dull, dull. But good luck. I have never looked back since quitting the one-size fits all JP manic mob and working for a small, hard-working happy consistent and truly local independent paper devoid of Kremlin-like edicts. I see JP have been carrying a Euro Footy championship spread in weekly pages. Didn’t their motto used to be Life is Local!!! Clearly some dont read captions ‘A mock-up of what the Echo will look like’. The comments about the headline are therefore irrelevant. I wish you all the best, its great to see local independants finally putting the likes of JP on the back foot! Long live those who try and a huge well done to those who have and will succeed!